In accordance of the latest research, many Americans tend to develop high blood pressure complications in early or later stage of their lives. Many people do not even come to know about the hypertension condition and remain untreated due to the complete absence of any sign or symptom related to the high blood pressure. The blood pressure measurement is mainly denoted with the help of two types of pressures- systolic and diastolic pressure. Although the high blood pressure condition does not reflect any particular sign or symptom but some of the common signs such as, dizziness, headache or nose bleeding etc, can be noticed in few of the patients of high blood pressure. There are various factors that can actually contribute in elevation of normal blood pressure in your body. Few of the factors like aging and family history are not in your control and hence, cannot prevent you from the risks of developing high blood pressure state. However, there are few causes such as, body weight, alcohol or tobacco consumption, the controlled intake of elements such as, sodium and potassium, level of stress, kind of physical activity etc, are possible to control and regulate your high blood pressure effectively. This article will provide you some effective remedies on how to lower your blood pressure naturally. People with high blood pressure problem should avoid their total dependency on medicines for controlling their high blood pressure. This is because there are certain natural ways or remedies with the help of which you can easily lower your high blood pressure and can maintain it for prolonged time. The ten most effective and popular natural methods or items are described below: Firstly, maintaining a healthy body weight can indeed help you to have a controlled blood pressure throughout your life. Therefore, if the obese or overweight people lose extra kilos from their body then they can actually reduce the strong medicine doses for controlling their high blood pressure. If you are not regular with definite exercise forms then you should at least be regular with brisk walk as it can greatly help in reducing the higher blood pressure state in your body. A brisk walk for 30 minutes every day can successfully contribute in lowering both the systolic pressure as well as diastolic pressure. As per the latest research performed by the Americans, the fluid extracted from hibiscus flower can effectively help in lowering the systolic pressure in the body. This fluid can be used in the form of tea and you must consume it for three times in a day for better result. You must cut down the intake of salt in your day-to-day life as the sodium element directly affects the blood pressure in terms of elevating it to an abnormally high level. The intake of some specific fruits such as, bananas, melons, sweet potatoes etc, can easily help in lowering the high blood pressure state in the body. Stress is considered to be one of the major factors for causing high blood pressure state in the body, therefore, you must get yourself indulge into recreational activities or meditation activities like yoga or some other breathing exercises. The consumption of beetroot juice on daily basis can also help in lowering the high blood pressure condition in a patient’s body. You should also avoid the excessive intake of caffeine as many scientists have stated with the help of their experiments that coffee can successfully raise the blood pressure value in the body. The consumption of garlic can also benefit you in terms of lowering the high blood pressure state. This is because garlic can actually make blood thin as the drug aspirin works. The intake of fish oil greatly works in lowering the high blood pressure condition in the body as few of the ingredients like DHA is indeed effective in controlling the hypertension in the body. Although medication is the most reliable method for regulating the high blood pressure condition but few natural methods or remedies as mentioned above, can also help in lowering the high blood pressure. High blood pressure is a serious, in many cases dangerous health condition. The traditional drugs, usually prescribed to control BP, have unpleasant side effects and in many cases do more harm than good. The good news is that there are alternative, simple blood pressure remedies. So if you are one of those suffering from HBP disorders read below. Bad eating habits or unhealthy diet can trigger BP related problems. In cases where you already suffer from BP disorder, an unhealthy diet can only worsen your condition. This is why the number one among the various blood pressure remedies is maintaining a healthy diet. A healthy diet doesn’t necessarily include special or expensive foods. In essence your meals must be rich in fresh fruits and vegetables, low fat dairy products and full grain breads. Fat foods as well as foods rich in spices and especially sodium must be avoided. Some herbs can be used to help BP problems. In some cases their effect is very good and regular drugs intake can be substituted by herbal medicines. The most popular herb associated with BP cure is the herb hawthorn. Garlic, although not a herb, is also very beneficial in relieving high BP symptoms. Other supplements that are good BP remedies are coenzyme Q10, fish oil, folic acid, potassium, magnesium, calcium. If your lifestyle doesn’t include much of action you must definitely change this. Start some stop or other outdoor activity. 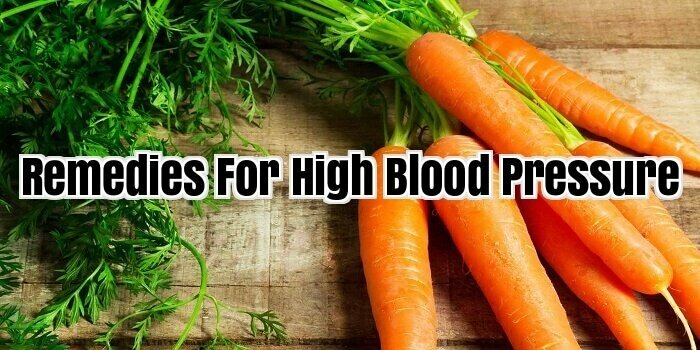 This will not only improve your BP but your overall health. Moreover sports are great for reducing stress, yet another reason for blood pressure disorders. Yoga, aerobics, jogging, swimming are all good ways to exercise. In case you are unable to participate in similar kind of sports activities you can start taking walks out in the open whenever u can or do mountain trips with your friends. Chinese medicine includes several of practices that are helpful blood pressure remedies. A combination of herbs and acupuncture can be used for normalizing the BP and helping avoid the use of dangerous drugs. The blood pressure is not a disease but it is a condition. Contrary to the popular belief, simply put, it is more a symptom than a disease. Blood pressure generally refers to high blood pressure or hypertension that is one of the most deadly conditions a lot of people across the world suffer from. Though the condition is quite difficult to tackle, we have many high blood pressure remedies; right from the allopathic (modern) medicines to ancient traditional herbal cure and from natural therapy to some exercises and holistic meditation and movements called yoga. Losing those extra pounds i.e. weight could make a big difference. Blood pressure may drop by up to 2.5/1.5 mmHg for every excess kilogram that you shed off. Losing excess weight not only helps as one of the blood pressure remedies but has other health benefits also. Make it possible to target to have some physical workout on five or more days in the week, for at least for half an hour. Exercises are good high blood pressure remedies especially brisk walking, cycling, swimming, aerobic etc. Regular physical workout helps in lowering blood pressure in addition to offer other health benefits. If you have already performed little physical activities in the past, and want to change to doing regular physical workout five times a week, it help in reducing systolic blood pressure by 3-10 mmHg. In order to know about blood pressure remedies, it is important to learn that the amount of sodium (table salt) that we consume can have adverse effects on the blood pressure. Health care professionals recommend that we should have not more than 3-5 gm of salt a day. (Most of the people nowadays have much more than this.) Tips on how to reduce sodium intake are mentioned below: You can simply replace salt with herbs and spices to flavour food. You can restrict the amounts of salt used in cooking, and do not keep salt on the dining table. For choosing the foods in the market, go for the foods labelled with ‘no added salt’, and try to give up processed foods as much as possible. Consume at least five portions, and typically 8-9 portions, of varieties of fruit and vegetables a day. The majority of the portion of meals must be starch-based foods (like cereals, wholegrain breads, potatoes, rice, pastas), add some fruits and vegetables. Undoubtedly, blood pressure remedies include not including much fatty food like fatty meats, cheese, cream milk, fried foods, dairy items etc. Instead, go for low fatty foods, mono-or poly-unsaturated items. Many health care providers favour including 2-3 portions of fishes a week. At least one of them should be ‘oily’; for example mackerel, salmon, kippers, sardines, pilchards, or fresh tuna. If you are found of meat it is better to eat lean meat, or some poultry like chicken but never red meat. The high blood pressure is one such condition that quite often leads to many life threatening disorders like cardiac failure or severe chronic heart disease in life. The hypertension state also termed as a silent killer for human race as it does not really reflect any particular signs or symptoms. Therefore, you must get your routine body check up to diagnose the state of high blood pressure in your body. The high blood pressure is basically the force or says pressure with which blood flows through the blood vessels, i.e. arteries and capillaries. This force is mainly exerted towards the wall side of the arteries and it finally results into widening of the vessels. It is mainly measured with the help of two major pressures- systolic and diastolic pressure. The consistent condition of high blood pressure in your body may leads to many serious health complications such as, heart attack, kidney failure or complications associated with nervous system and vision of the individual. There are several common factors responsible for resulting hypertension state in the body such as, overweight condition, family history, unhealthy lifestyle, uncontrolled alcoholism, excessive intake of birth control pills or pain killers and many more. However, some other underlying factors like presence of diseases like kidney or adrenal diseases, thyroid complications or inflammation in blood vessels may also eventually cause the high blood pressure condition in the body. Overall, it is essential to regulate high blood pressure state in your body which can also further help in maintaining your heart health for lifetime. Apart from being totally dependent upon the medication, some natural remedies, especially some effective homeopathic remedies can indeed help in lowering the high blood pressure state in the body. Similarly, several homeopathic remedies for high blood pressure treatment are mentioned below: Glonoinum: It is highly effective for reducing the high blood pressure condition in your body. However, you may get some side effects in the form of severe headache or sensation on angina pain through your chest. Nux Vomica: The high blood pressure can easily be treated with the Nux, however, the consumer may develop the complications like nausea, stomach ache, diarrhoea or mood swings problem. Natrum Mur: This is another one highly effective homeopathic option that helps in dealing with symptoms that are caused by grief or any emotional reason. Aurum: This is one of the popular recommendations for people with high blood pressure condition. It is most suitable for those conditions when high blood pressure state is resulted because of the stressful conditions in life or so. Baryta Carbonica: people with poor concentration and high blood pressure complication are usually recommended this particular homeopathic pill for quick relief. Belladonna: It is one such option which is highly effective when it comes to regulate the high blood pressure condition in the body. However, it may also leads to the complications like headache, stroke etc. The above mentioned homeopathic options are proven to be suitable on the basis of the condition of the body and it may vary from one individual to another. Low blood pressure, hypotension, is often confused with hypertension because they sound similar. However, they are complete opposites. Both however do have serious health consequences. Blood pressure is controlled by the autonomic nervous system. This organism uses an infinite network of hormones, receptors and nerves to equilibrium the effects of the sympathetic nervous system &#40;which raises blood pressure&#41; and the parasympathetic nervous scheme (which lowers blood pressure).This allows people to exercise and perform other activities without a drastic change in blood pressure. Salt- People avoids salt to maintain a normal blood pressure. But people suffering with low blood pressure can be liberal with quantity of salt uses in their food. Consume as a good deal salt as you can tolerate as it increases blood pressure. Drink at least 8 glasses of water every day. It helps to maintain a normal pressure of the blood. Have a sweet tooth- start your day with something sweet or some extra sugar in your tea/coffee. Have as many sweet dishes as you like unless you have diabetes. Sweets give you extra energy and immediately normalize the blood pressure. Avoid going to overcrowded areas as you may feel heaviness or dizziness. Keep your feet on an elevated platform as gravity pull decreases blood pressure. Do not stay in a standing position for long. Keep moving your legs or shake them a bit. At home sit at a low chair such that your knees are at a higher level than your chest. This sends the blood towards heart thus increasing the pressure of the blood. Always carry a chocolate with you. Whenever you feel a drop in your blood pressure or feel low, unwrap the chocolate and eat it as soon as possible. You would feel better with every bite. Ginger – Most commonly used Asian herb it is equally useful in controlling high and low blood pressures. Coffee – Coffee being a strong stimulant can create magic in case of mild low BP conditions. Sipping a cup of this aromatic beverage early morning is enough to maintain the blood pressure at desired levels. Beet root– A cup of raw beet root juice if taken twice daily is good to treat this condition, improving the condition within one week. Indian spikenard – Taking 30-40 grains mixed with pinch of camphor and cinnamon regularly raises the low blood pressure. Taking the extract of this herb also gives similar results. Ginseng – This herb is known to normalize all the functions of the body and that includes the normalizing of BP too. Siberian Ginseng – Though it is similar to the other ginseng herbs, studies revealed that this variety raises the BP of only those who are suffering from low BP. Stinging nettle – This is an herb that nourishes and helps to build up blood cells and also raising the blood pressure in those suffering from hypotension. This herb can be taken as extract, tea or in capsule form. Hawthorn – Though used in treating high BP it functions mainly to stabilize the BP and bring back to its normal state. Rosemary – This herb in useful in treating low BP. Taking 10 ml. of the extract daily stabilizes the BP. Motherwort – Extract of this herb, though bitter in taste helps in raising the BP to desired levels.